House/Nyumba (feminine) The woman’s hut is the centre of the nuclear family. If the man is polygamous as most of them were, each person in the homestead identified with a mother’s Nyumba. Home/Mucii: The entire homestead consisting of several Nyumbas and the man’s hut, thingira, plus other secondary elements like a cattle kraal and granaries was surrounded by a fence and the whole called Mucii or home and was identified with the man. Mbari/Sub-clan: Several homesteads of related cousins and not too distant cousins were identified as belonging to a Mbari. The Mbari was identified with men’s names. 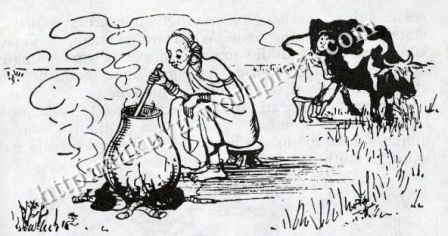 Clan/Muhiriga: The most important classification in terms of a sense of identity for the Gikuyu was the clan which was associated with distinct characteristics and common rules governing such important rituals as marriage, circumcision, etc. They also shared a common totem. This was definitely feminine in nature and each clan name went back to one of the original 9+1 daughters of Gikuyu and Mumbi, the father and mother of the tribe. Nation/Ruriri: The Gikuyu could only conceptualise the others outside their tribe as belonging to another ‘world’ or system of ideas. After the Colonial experience and independence in 1963, the country’s different tribal nations, all 42 or so in number were brought together to form one Nation, Kenya. The sense of a single Nationhood is slowly taking shape though the tribe seems to have the stronger mental hold to date. In time as the concept of a modern nation takes hold the tribal notion is expected to weaken. Is the Nation masculine or feminine? One World/Thi Yothe: This is the forging together of all nations to build one shared consciousness. As the interconnections grow stronger and stronger, this consciousness has been growing all over the world. The entire spiral construction starts from a navel and continues to infinity. It is much like the fiber basket the south African girl is holding on her head. Examined closely, it is seen that the quintessential spiral of the Gikuyu is their basket, the ‘kiondo’ which is basically a spiral woven together with radiating strings from a navel and forming into a self supporting container basket. The kiondo is also much more powerful symbolically because traditionally it was arranged as stages, (matiina) which were clearly marked and divided with stripes. In the mat shown above a continuous green strip alternates with a dashed one in a cosmic harmony reminiscent of the Yin and Yang of Chinese cosmology. In the I-Ching the masculine Yang is denoted as a continuous line and the feminine Yin as a line with a gap in the middle. The stages also marked the path of life from birth (navel) to death (gutiriha) which will be discussed in detail in another post. Each stage, (itina) requiring a strip or initiation before the next stage. The Kiondo as a spiral weave construction is a happy marriage between the feminine weft (rurigi), holding the uprights masculine warp (mirugamo), into a firm singular shape symbolizing the wholeness of the web of life. This is what I call, “The Gikuyu Kiondo Kosmology” or “The Architecture of Gikuyu Thought”. Ground Plan of Borobudur showing the successive stages (Matiina) of spiritual development. A reconstruction of Borobudur in an artist’s mind’s eye. Borobudur combines the ideas of the spiral as in the Gikuyu kiondo, the sacred mountain of God like Mt. Kenya, Mt Sinai, Mt Meru etc., and the sacred tree at the centre linking Heaven and earth (Axis Mundi). Such trees are like the Gikuyu Mugumo, the Norse Yggdrasill, the Christian Tree of Knowledge of good and evil etc. The Kiondo has all these symbols embed in it. It is probably the most powerful document among the Gikuyu people and codifies Gikuyu cosmology in a text much like the Maya Calender stone below. The Gikuyu Gicukia Dance where young men and women holding each other like weft and warp enact the dance of life around a Mukuyu tree or Axis Mundi. This photograph was taken by father C. Cagnolo of the Catholic Mission of the Consolata Fathers at around 1910. THIS IS THE KIKUYU KIONDO KOSMOLOGY.